I was out late at night, walking through the desert. I soon got tired and went under a hanging rock to take a sleep. I laid down on the sand and was zonked out in seconds. I woke up a few hours later to find that I was covered with sleeping rattlesnakes. They don’t snore, but shake their rattles while sleeping. That’s what woke me up. I fought back my panic with the thought, “Oh, this is cute. They feel comfortable enough to sleep with me. Perhaps they might be my new found friends.” I managed to fall back asleep. 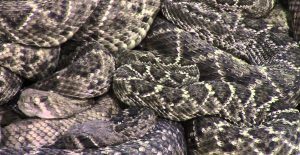 In the morning the rattlers woke up and thanked me for the warmth. I nodded and said I was glad I could help.